In bowl mix cauliflower florets,turmeric powder and salt. Preheat the oven to 380 F. Spread the mix in baking sheet and bake for 30 minutes. Heat oil in a pan , add onion and cook till it translucent. Add garlic,green chilli,tomato ,Garam masala ,chilli powder and and cook till masala get cooked. 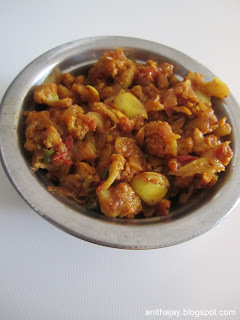 After add cauliflower and mix well still it coated with spices. Add small amount water and cook till it get dry. It can be served for Roti or rice. We can stuff it in roti and can serve as a chappathi roll. Love this guilt free baked masala,yummy.